After a journey break in our Indian tribal tour, we are back to our scanning of various tribes of India. Today in focus are the Bhutia tribes of India. Originally of Tibetan origin, Bhutia tribes migrated to Sikkim in around 16th century. Today, these Indian tribes constitute a massive 14% of total population of Sikkim. Bhutia tribes are kind and warm hearted people and the hospitality shown here is something that is distinctive from other tribes in India. So, drive up to Sikkim and explore the best of Indian tribal culture, and enjoy the best of cuisines of these Indian tribes. Bhutia tribes inhabit in the dry valley of northern part of Sikkim. Among the localities, they are also known as Lachenpas and Lachungpas. Sikkimese is the highest spoken language amongst Bhutia tribes of India. Lepcha, Bhutia, Nepali, English and Hindi are some of the other languages on which Bhutia tribes are good at. Very few tribes in India except Bhutia tribes have such good command on so many languages. 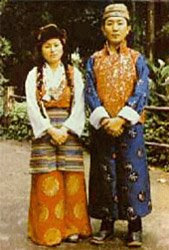 Bhutia tribes have a very distinguished dressing culture. Females usually prefer heavy jewelery of pure gold with full sleeves blouse and a loose gown type garment. Males prefer wearing Bakhu which is a loose traditional dress with the full sleeves. These tribes of India live in a rectangular house called Khin. 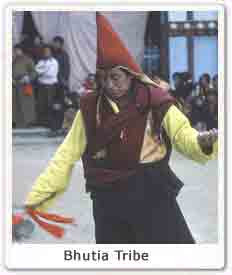 Bhutia tribes follow tantric Buddhism. Their legal framework form the best part of the culture. They term it as Dzumsa, which means the rendezvous point of the common masses headed by Pipon. Almost all the occupational responsibilities like grazing etc fall on the Pipon. Agriculture, herdsmen ship and the breeding of sheep and yaks form the main source of occupation amongst Bhutia tribes of India. Bhutia tribes are mainly rice, animal fat and beef eaters. Come to Bhutia tribes in India and enjoy stuff like Momos, Ningro with Churpi, Sidra Ko Achar, Pakku, Kodo Ko Roti, Silam Ko Achar, Phulaurah Gundruk, Phagshapa, Sael Roti. They are very fond of Chaang (the millet bear). It is served in the special bamboo container called Tongba with the hollow pipe made of Bamboo. the Tibetan new year. The act of Fire Metho in the evening is something to look forward for. On the other hand, Losoong in the month of December marks the end of the Harvest season. Electrifying atmosphere, with Chaan dancing, merrymaking at the monasteries at Palace (Tsuklakhang), Phondong and Rumtek add zing to the festivals. Archery competition, offerings to the God, are some major seeings at the festival. Stage fights and passing through the crowds with the fire torches add another ting of excitement to the festival.